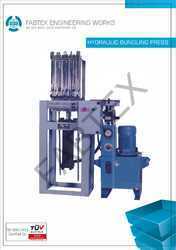 Prominent & Leading Manufacturer from Coimbatore, we offer hydraulic bundling press. With full leverage on our industrial expertise, we are manufacturing and supplying supreme quality Bundling Press. Our offered ines by utilizing team of skilled professionals and progrmachines are widely appreciated by our customers, owing to their effectiveness in operation for longer time span. We design these machessive techniques as per latest industrial norms. Apart from this, these machines are offered to customers in durable packaging at equitable price tags. Suitable for bundling of 2.5Kg and 5Kg Yarn. 2 HP motor saves energy.